One email message per post. Email delivery disabled: no email sent to you from this group. For example = "Test Member (profile)"
4. 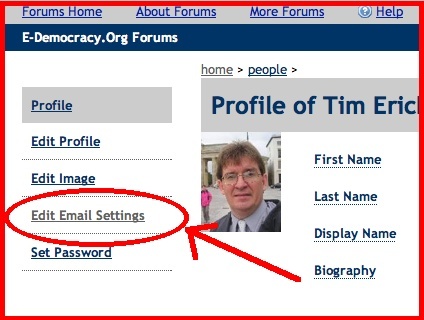 Scroll down the page to the section with the heading "Group Email Delivery Settings"
5. Locate the "Message Notification Settings" option, for your group. Daily digest of topics. - This is a daily email with LINKS to recent topics that you can view on the web site.